Ryobi's 10-inch Table Saw with Stand is lightweight and easy to use, making it a great addition to any tool collection. It features a 15 amp motor that can generate up to 5,000 RPM for powerful cutting and a 25 inch x 17 inch table that provides support for large ripping operations. There is also an adjustable miter gauge for accurate cross-cutting. This RIDGID 10 -inch 15 Amp Compact Table Saw features a dual-locking rip fence that clamps on both the front and rear of the table for accurate alignment. The anti-kickback pawls allow effortless removal and installation independent of the blade guard and the integrated riving knife/spreader quickly converts from a spreader to a riving knife when non-through cuts are needed. 10-inch 15 amp Table Saw with Steel Stand Ryobi's 10-inch Table Saw with Stand is lightweight and easy to use, making it a great addition to any tool collection. 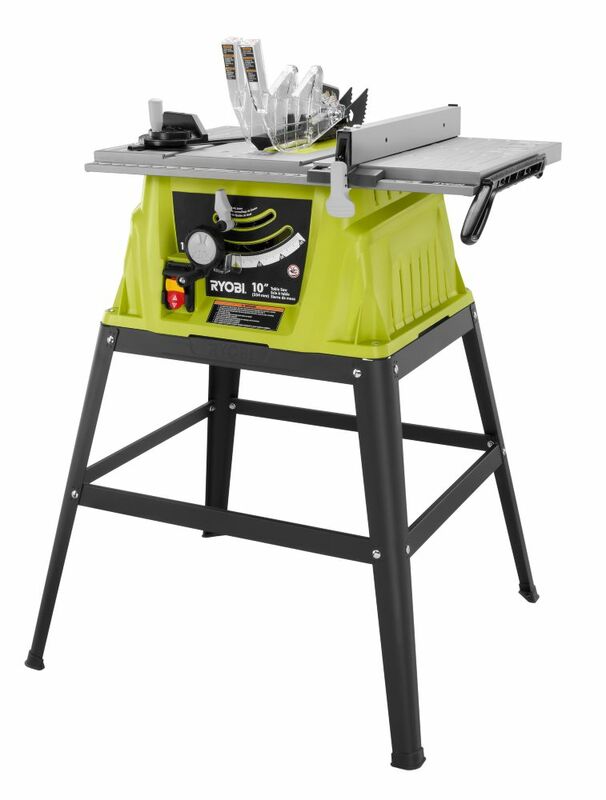 It features a 15 amp motor that can generate up to 5,000 RPM for powerful cutting and a 25 inch x 17 inch table that provides support for large ripping operations. There is also an adjustable miter gauge for accurate cross-cutting. 10-inch 15 amp Table Saw with Steel Stand is rated 4.0 out of 5 by 649. Rated 5 out of 5 by Kathleen from My husband loved it !! It is perfect for... My husband loved it !! It is perfect for all his home projects !!! Rated 5 out of 5 by SideshowBob from A great light weight table saw you can take anywhere. No its not going to be the same precision a... A great light weight table saw you can take anywhere. No its not going to be the same precision as a $600 table saw. But it doesn't cost $600 or weigh 600lbs either. Plenty good enough for most uses. Rated 5 out of 5 by Bozo from More powerful than I thought. Fantastic. More powerful than I thought. Fantastic. Rated 5 out of 5 by Krezz from Simple for the DIY project Completed my living room reno with this and other Ryobi product. Did the job well enough for what I expected. Nothing wrong with it. what depth of wood can it cut?